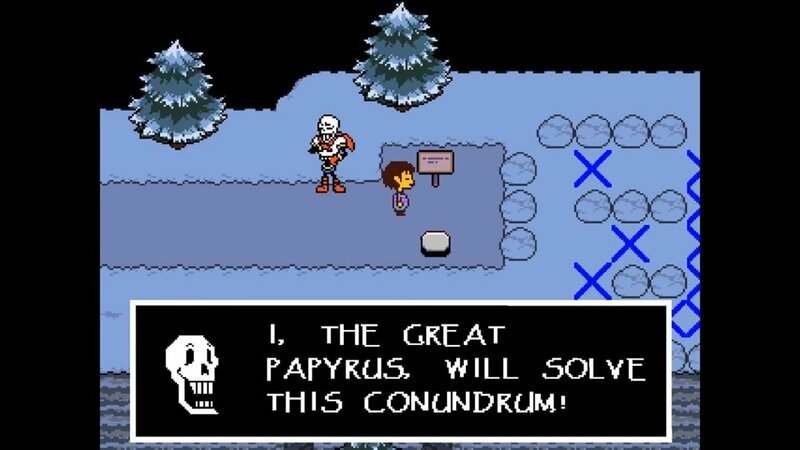 TL; DR(eview) - Undertale is a short and sweet tribute to the classic JRPG genre that manages to remain recognizable to the genre, while at the same time subverting and elevating it. It’s design and soundtrack are among some of the finest of the last few years. Potential spoilers for Undertale below. This was my third attempt at playing Undertale. After it was such a critical darling at the tail end of 2015, I picked it up on Steam. It was going to be that rarest of rare games that I would force myself to play on PC. But that was also right around the time I launched Trevor Trove and started spending a couple hours a night in front of the computer writing. Between that and my 9-to-5, sitting down to play Undertale on PC felt too much like work. I got through the opening stuff with Toriel, but, when I accidentally killed her while attempting a pacifist run (and knowing that the game would remember that I killed her), I panicked and went to something else. Attempt number two came after my breakup a few months later when I moved back into my old studio apartment. I made it a little bit farther this time (meeting Sans and Papyrus) but I still couldn’t be bothered to stick with it. Finally, when it was stealthily announced for PlayStation during the pre-show of the Sony E3 conference, I knew I’d actually sit down and play through the game on my PlayStation 4 or Vita. When I finally managed to progress through the game, it was easy to identify all of the charm and humor that people had seen in the game a couple years ago. An obvious send-up of RPGs of old, most notably Earthbound), Undertale has you playing as a young child who has fallen into the world of the monsters, looking for a way out. Long ago, a war between people and monsters left the two races irreversibly enemies, with monsters even being sealed away in their realm, unable to escape unless they break the spell by collecting souls (i.e. murdering you). 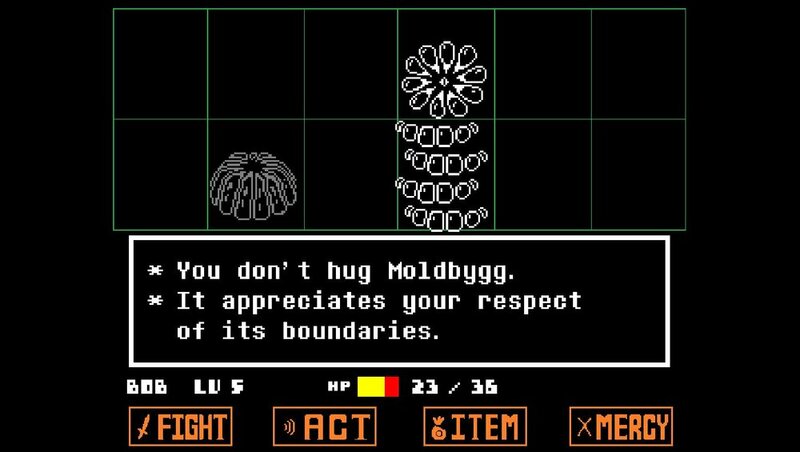 A couple of game elements really set Undertale apart from other games. The first and most easily identifiable is its unique take on the formula of turn-based JRPG combat. Sure, you can go for the standard fight option and slash/punch/etc. away at your opponent’s health. But you can also select from a variety of peaceful actions. The monsters might still attack you and require you to move your heart around the battle area, dodging their attacks. Every enemy in the game has unique attacks that you’ll need to learn, making every instance of combat its own unique mini-game. As you progress through the game, these sequences will inevitably become more varied and difficult to avoid but as you do so, it can lead to the monster’s themselves losing the will to fight. Which brings us to the game’s other largely unique element: when these monsters lose their will to fight, you can spare them through the act of Mercy and win through a more pacifist approach. In fact, you can beat the entire game without killing anyone and receive a so-called pacifist ending. On the flip side, you can also treat the game like most other JRPGs and just fight your way through the monsters, gaining experience, leveling up, and getting stronger as you go. You can even kill all of the enemies in the game for a distinctly different genocide ending. Your actions will follow you through the game, with drastically different paths through the game depending on how you play. A more pacifist run will feature characters joking with you and giving you some extra puzzles to complete, while a more genocidal run leaves citizens so afraid that you’ll come across completely empty towns after your notoriety scares people away. And there’s always a more neutral run, where you might kill some enemies and spare others. After playing through the game in a pacifist run before attempting a genocide run, I was thoroughly amused by how different the game felt from one extreme to the other. The look and feel of the game is - for the most part - pulled directly from the Super Nintendo era of the genre. One of my favorite scenes, in fact, was a direct homage to the famous Opera scene of my all-time favorite game Final Fantasy VI. The handful of characters you’ll meet throughout the game have great motivations and personality. The monster designs are also interesting and diverse to the point that they never wear out their welcome. The soundtrack of the game is also worthy of special mention. Even when I couldn’t connect with the game itself in my earlier attempts to play it, I absolutely adored the music. Chip-tune in nature, every song feels as though it belonged in the NES/SNES era. And there’s incredible variety to go along with the game’s own highly diverse range. I do feel I need to call out the pacing of the game a little bit. While there are lovely little character moments throughout the game, it felt like about 80% of the story and plot doesn’t really come to light until the last 10% of the game. This was especially apparent in the true pacifist run, which is really the only place most of the lore and history is expressly detailed and all of that comes in the final hour-ish of the game. A single run of the game as a whole can probably be beaten in 4-6 hours so it’s not a huge issue but still something that jumped out at me as I thought about the game after beating it. Undertale is definitely a wonderful love letter to the classic RPG-era of games but puts enough of it’s own unique twist on the genre, both with its characters and its gameplay, that it winds up oozing with a personality all its own.